Serving summery, mango-studded chicken salad in lettuce wraps is the perfect way to promote a festive atmosphere and please a gluten-free crowd with a party mindset. Drizzle with a fantastic avocado dressing for a pretty presentation. Place chicken and mango in a mixing bowl. Add in rest of ingredients and stir until mayonnaise is fully incorporated. Drizzle dressing over chicken and lightly toss to combine. 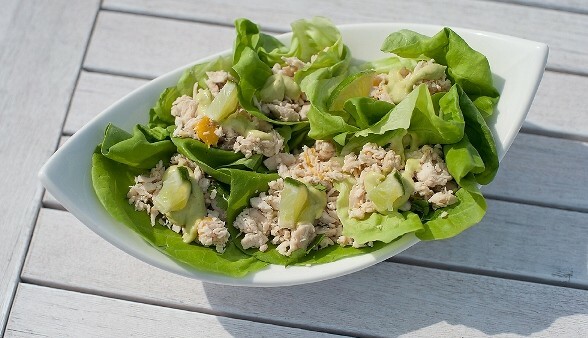 Then spoon chicken salad into individual lettuce ‘cups’. Optional: Top each one with remaining dressing and coarse ground salt. Nutrition Analysis (for filling only): 510 cal, 42 g fat, 40 mg chol, 500 mg sodium, 26 g carbs, 9 g fiber, 15 g sugar, 14 g protein.